I’ll be the first to admit: I am not much of a baker. I have my favorite recipes, naturally, that work for me, like the wonderful-yet-complicated french bread that I adore, even if I don’t make it often because it takes the entire afternoon. And I came across this one. It was a no-knead bread, which has given me problems in the past, but it didn’t call for any extended rising time forgotten in the back of the fridge. In fact, I could make it in about two hours. Now, it doesn’t produce the high-rising form of the kneaded loaves, so you wind up with fairly small slices, but it’s good enough for Sprats and Avocado Sandwiches. I mentioned that I’m not much of a baker, right? The first one didn’t come out too well because I kinda didn’t get the yeast to activate because I used cold milk (whoops). But it was still pretty good, good enough to try again. The second one came out really well. But the third one, the one I show here today, came out the best. So, here’s my advice. Use some fresh juice, just like they call for as it adds some nice flavor. Do use dry milk, or if that’s not a possibility, warm up the fresh milk to 110F else the yeast will just continue sleeping. Try sprinkling some seeds or nuts over the top because that’s really yummy. And try to resist slicing into it for at least 30 minutes after it comes out of the oven. Optional addins/toppings: sunflower seeds, walnuts, etc. Grease well a standard loaf pan (I use a 9×5, but an 8.5×4.5 is fine too) as this bread sticks. Combine all of the ingredients in a large mixing bowl. Beat on medium speed for 3 – 4 minutes — it will look like a batter, not a dough. 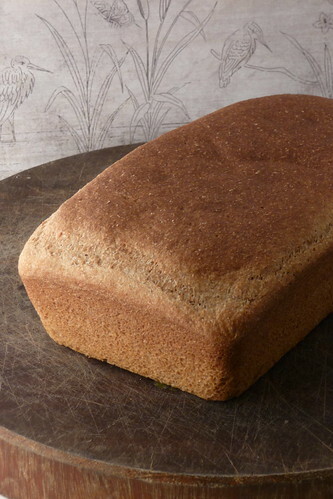 Scrape the mixture into the prepared loaf pan and cover with a tea towel or plastic wrap. Let it rise for an hour — but don’t expect it to rise to the top of the pan5 or dome. Preheat the oven to 350F during the last 20 minutes of rising. Uncover the pan and bake for 45 minutes, tenting with foil after 25 minutes to prevent overbrowning if necessary. Remove and allow to rest in the pan for 5 minutes before turning out onto a cooling rack. We happen to have pineapple-orange in the fridge this week, so I used that. I’m curious to see what would happen with lime or lemon, since I always have that on hand. You can just use water if you don’t have any juice on hand too. The original calls for molasses. If you have that, try it. I plan to use honey on the next loaf. Dry milk reconstitutes at a 1:4 ratio. To use regular liquid milk, warm 1 cup of milk and omit 1 cup of water along with the dry milk. Instant yeast, how I love thee. Works better, faster and more consistently than active dry and needs no proofing. Just add it to the flour. If you are using active dry, increase the yeast to 2 1/2 tsp or one packet and proof in the warm water for 5 minutes. My second loaf did manage it in an hour. It promptly collapsed in the oven, making a nice V-shape. For various values of nice. If it rises 2/3rds of the way, it’s ready to go in the oven. This entry was posted in american, bread, recipes, side, snack, untranslated. Bookmark the permalink.